SEATTLE, WA, 09/14/2010	–	The Velo Transit website will focus on American made packs and bags, produced directly by Velo Transit in Seattle WA, as well as other bike commuter and cyclo-oriented items produced by other US manufacturers. The company believes that a collection of products designed, manufactured and sold domestically will be more responsive to the needs and wants of the consumer. Velo Transit offers also a higher quality alternative to the standard Made in China products of the major brands. 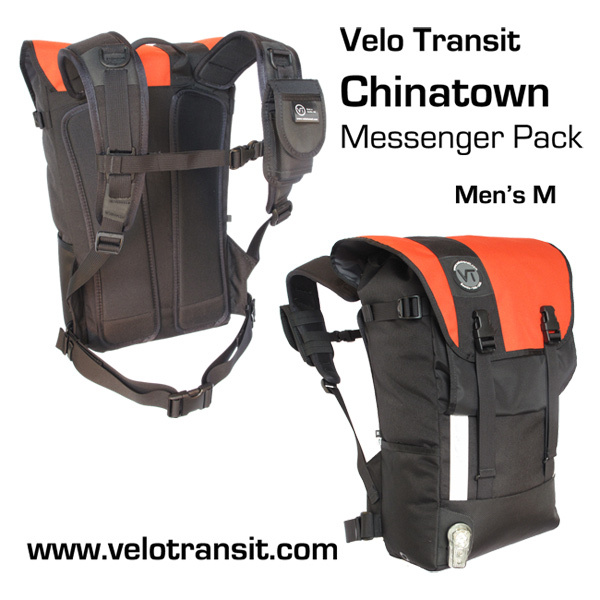 and various accessories for both packs and messenger bags. The sized men’s and women’s packs will be appreciated by men with longer torsos and women who have had trouble finding packs that fit their shorter torsos and feminine curves. The messenger bags as well as the messenger packs have RF-welded polyurethane coated nylon linings, which make them 100% waterproof. Located in Seattle WA, Velo Transit believes it has the perfect location to build and refine waterproof Urban cycling gear. Given that bicycle commuters count for 10% of the overall cycling market, this specialty niche has long been overlooked and is eager for products designed specifically for them by fellow commuters right here in the USA. We’re looking forward to checking out the Velo Transit line in person while we’re at the big show in Las Vegas…and with a little luck, we’ll be able to get a sample or two to put through the ringer.